Take2 update: Eight new seminars in the Take 2 series. Attracting youth to the agriculture sector by transforming it into a business and offering them new avenues and opportunities to engage along the agriculture value chain will be the focus of the Mali Agribusiness Incubation Hub (MAIH) launched recently. The incubation hub will primarily focus on Youth Business Incubation (YBI), Agro Processing Business Incubation (APBIU) and Seed Business Incubation Units (SBIU). The hub will promote young entrepreneurs in agro processing products; cereals and fruits; and seed business through skills and services based opportunities. The hub will operate in a public private partnership mode and will serve the Francophone African countries. 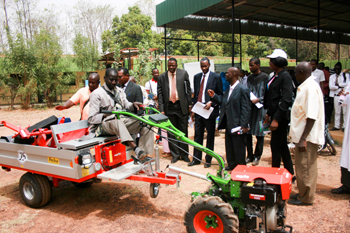 It has a ‘hub and spoke’ model located in three institutes: ICRISAT-Mali, Institut d’Economie Rurale (IER), Sotuba and Institut Polytechnique Rural (IPR), Katibougou. At the launch of the hub more than 50% of the 600 participants registered for the incubation program. Mr Kassoum Dénon, Malian Minister of Agriculture, appreciated the efforts of MAIH promoters and said, “it is a strategic initiative of the Mali government to transform agriculture into business opportunities and create an enabling environment that can not only create wealth but also maximize employment,” as he called for full engagement of all other ministries and concerned actors “in a spirit of frank cooperation by pledging support and resources for the success of the activities of the incubator”. “Promotion of agro-ventures in these areas offers lot of scope for entrepreneurship and employment opportunities, meaning that new income sources will open up especially for rural youth and women,” said Dr Bourema Dembele, Chairman, MAIH and Director General, IER. “One of the unique interventions is the seed business incubation program in which farmer cooperatives are promoted as seed business. Such programs will also be planned and implemented in Africa. ICRISAT will extend all help in implementing such programs to especially benefit the small and marginal farmers of Africa,” said Dr Ramadjita Tabo, Director - West and Central Africa, ICRISAT Mali. The launching of MAIH was held in two phases. The official ceremony on 22 February was attended by the Malian Minister of Agriculture and other ministers of the Government of Mali. A second launch, dedicated to the Youth Business Incubation (YBI) was held on 23 February at IPR targeting mainly students and other youth interested in entrepreneurship in agribusiness sector. “The incubation is a motivation as it breaks the barriers in the agricultural sector, providing opportunities for businesses and wealth creation. If the incubator is well operated, and it focuses on supporting the youth and incubating them to grow into business, it will contribute both in creating jobs and employers,” said Mr Dramane Tounkara, National Coordinator of Global Youth Innovation Network for Mali. The event was presided over by Mr Dénon and attended by many dignitaries: Dr Nango Dembele, Minister of Livestock and Fisheries, Mr Konimba Sidibe, Minister of Investment Promotion and Private Sector, Professor Assetou Foune Migan, Minister of Scientific Research, and Mr Mahamane Baby, Minister of Employment and Vocational Training and Mr Jean Larsen, Private Sector Counselor, Embassy of Denmark. 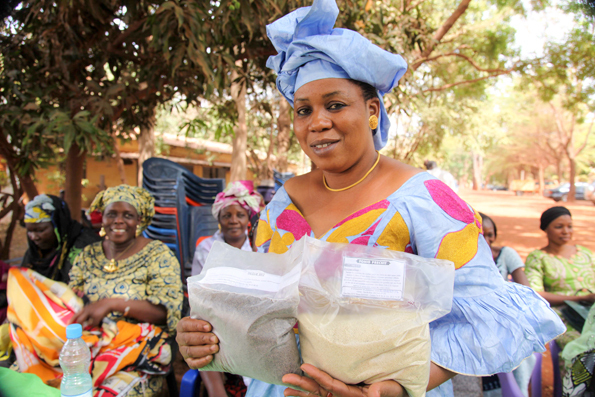 “I started a seeds business at a time when it was difficult to get support from the banking system for agribusiness. I faced a lot of rejections, but I was able to stand with perseverance. Nowadays, thanks to the incubator, young people who want to create enterprises may not have to go through some of that; many opportunities are there but they still need to stand strong and be brave” said Madam Coulibaly Maimouna Sidibe, CEO of a pioneering private seed company, Faso Kaba. “Youth can now count on good support from the incubator to strengthen their capabilities and help them start their businesses and accomplish their dreams,” said Dr Jean Moreira, Value Chain and Post-harvest Technology Consultant, Africa Rice. The MAIH is promoted by IER, IPR, Conseil Ouest Africain pour la Recherche et le Développement Agricole/West and Central African Council for Agricultural Research and Development (CORAF/WECARD), African Agribusiness Incubation Network (AAIN) and the Universities, Business and Research in Agricultural Innovation (UniBRAIN) project of Forum for Agricultural Research in Africa (FARA) and ICRISAT. 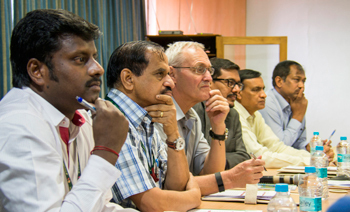 It will benefit from the support of ICRISAT’s Agri Business Incubation program (ABI) of the Agribusiness and Innovation Platform (AIP). The MAIH is part of a mandate given to ICRISAT-ABI by UniBRAIN-FARA and funded by Danish International Development Agency (DANIDA). UniBRAIN has set up six value chain Agribusiness Incubation and Innovation Consortia (AIICs) in five African countries and MAIH will be also strategically supported by AAIN. Wheat pre-breeding at NIAB: from germplasm to genomics. The Peanut Foundation - Industry Funding of Genomic Research. An International Effort in Peanut Genetics and Genomics. Dr Baozhu Guo – Research Plant Pathologist, United States Department of Agriculture, Agricultural Research Service, Crop Protection & Management Research Unit, Georgia, USA. Global Futures and Strategic Foresight: Quantitative modeling to inform decision making in the CGIAR and its partners. Keith D Wiebe – Senior Research Fellow, Environment & Production Technology Division, IFPRI, USA. Accelerating innovation: Rothamsted’s Future Science Strategy. Understanding plant response to growth under nitrogen limitation conditions to improve crop nitrogen use efficiency. Can we breed for efficient root system for water and nutrient uptake in crops?. Global Cropland Area Database (GCAD) derived from Remote Sensing in Support of Food Security in the Twenty-first Century: Current Achievements and Future Possibilities. Published: 2015. In: Land Resources Monitoring, Modeling, and Mapping with Remote Sensing (Remote Sensing Handbook). Taylor & Francis, Boca Raton, Florida, 01-45. Abstract: The precise estimation of the global agricultural cropland- extents, areas, geographic locations, crop types, cropping intensities, and their watering methods (irrigated or rainfed; type of irrigation) provides a critical scientific basis for the development of water and food security policies. By year 2100, the global human population is expected to grow to 10.4 billion under median fertility variants or higher under constant or higher fertility variants with over three quarters living in developing countries, in regions that already lack the capacity to produce enough food. With current agricultural practices, the increased demand for food and nutrition would require in about 2 billion hectares of additional cropland, about twice the equivalent to the land area of the United States, and lead to significant increases in greenhouse gas productions. Salt-tolerant genes from halophytes are potential key players of salt tolerance in glycophytes. Abstract: Salinity is one of the most important abiotic factors, besides drought, extreme temperatures, light and metal stress. The enhanced burden of secondary salinization induced through anthropogenic activities increases pressure on glycophytic crop plants. The recent isolation and characterization of salt tolerance genes encoding signaling components from halophytes, which naturally grow in high salinity, has provided tools for the development of transgenic crop plants with improved salt tolerance and economically beneficial traits. In addition understanding of the differences between glycophytes and halophytes with respect to levels of salinity tolerance is also one of the prerequisites to achieve this goal. Xylanase Production by Isolated Fungal Strain, Aspergillus fumigatus RSP-8 (MTCC 12039): Impact of Agro-industrial Material as Substrate. Abstract: In the present investigation, the imperative role of agro-industrial biomass for improved xylanase production was evaluated using isolated fungal strain. The study suggested that, in xylanase production by Aspergillus fumigatus RSP-8, one of the major limiting factors is substrate chemical complexity. Imputation of single nucleotide polymorphism genotypes in biparental, backcross, and topcross populations with a hidden Markov model. Abstract: In this research an existing general algorithm for tracing allele inheritance in known pedigrees was modified to enable genotype imputation in specific crosses (biparental, backcross, and topcross) that are common in plant breeding. The extension was tested with a series of representative simulated examples of these crosses. The results show success of imputation is affected by many factors including the number of low-density markers per cM, level of inbreeding or intercrossing of the individuals to have genotypes imputed, level of inbreeding of the parents of a cross, and genome length; but not by the number of high-density markers or by the interaction between the genome length and the number of low-density markers. With as few as one or two markers per 20 cM genotype imputation was successful when parents were inbred. Therefore, genotyping strategies in which inbred parents of a cross are genotyped at high-density and their descendants are genotyped with 200 to 400 markers genome wide may be cost effective and useful in practical plant breeding programs that utilize genomic selection. Evolution and impacts of groundnut research and development in Malawi: An ex-post analysis. Abstract: This study aims to assess the economic impacts of investments in groundnut research and development (R&D) in Malawi, covering the period 1982-2013. Relevant information on investments and changes in outputs was gathered from a range of sources including a smallholder household survey and secondary data provided by international and national agricultural research programs, and non-governmental organizations. The economic surplus approach (the PEDPIS method and the Akino-Hayami method) was employed to compute the internal rate of return (IRR) and the net present value (NPV). It was found that the IRR for the base scenario was 22%, higher than the opportunity cost of capital being 11%, indicating that the investment was competitive as well as profitable. The NPV ranged from US$204 million to US$206 million, depending on the calculation method. With sensitivity analyses, the NPV remained positive and the IRR stayed above 11% in all scenarios except when the research and extension costs were raised by 50%. The IRR compares well among impacts of crop research in sub-Saharan Africa. The result implies the need for policy formulation towards long-term commitment to developing improved seeds, reinforcement of the seed systems, and enhancement of extension services to smallholders. Genome-wide dissection of AP2/ERF and HSP90 gene families in five legumes and expression profiles in chickpea and pigeonpea. Abstract: Comprehensive survey identified a total of 147 AP2/ERF genes in chickpea, 176 in pigeonpea, 131 in Medicago, 179 in common bean and 140 in Lotus, whereas the number of HSP90 genes ranged from 5 to 7 in five legumes. This study identified potential candidate genes in response to heat stress in chickpea while for FW and SMD stresses in pigeonpea. For instance, two DREB genes (Ca_02170 and Ca_16631) and three HSP90 genes (Ca_23016, Ca_09743 and Ca_25602) in chickpea can be targeted as potential candidate genes. Similarly, in pigeonpea, a HSP90 gene, C.cajan_27949, was highly responsive to SMD in the resistant genotype ICPL 20096, can be recommended for further functional validation. Also, two DREB genes, C.cajan_41905 and C.cajan_41951, were identified as leads for further investigation in response to FW stress in pigeonpea. Tester Effect on Combining Ability and Its Relationship with Line Performance per se for Grain Iron and Zinc Densities in Pearl Millet. Abstract: Two broad-based and diverse populations of pearl millet [Pennisetum glaucum (L.) R. Br.] were crossed with 14 diverse inbred lines in each of two experiments to produce 56 topcross hybrids, which were evaluated along with their parental lines for grain Fe and Zn densities. Results showed that there was highly significant and moderately high positive correlation between the topcross hybrid performance per se (a measure of GCA) produced with the two testers, both for Fe and Zn densities in both experiments. However, the correlation between performance per se of lines and their topcross hybrids averaged over both testers (giving more reliable estimates of GCA than individual testers) was even higher for both micronutrients and in both experiments. Thus, while each tester was effective in identifying 30 to 35% of the top-ranking high general combiners as reflected in topcross hybrid performance, line performance per se was even more effective in identifying these top-ranking combiners for both micronutrients in both experiments, indicating that based on performance per se lines can be selected for high GCA of Fe and Zn densities in pearl millet. Identification of candidate genes for dissecting complex branch number trait in chickpea. Abstract: The present study exploited integrated genomics-assisted breeding strategy for genetic dissection of complex branch number quantitative trait in chickpea. Candidate gene-based association analysis in a branch number association panel was performed by utilizing the genotyping data of 401 SNP allelic variants mined from 27 known cloned branch number gene orthologs of chickpea. The genome-wide association study (GWAS) integrating both genome-wide GBS- (4556 SNPs) and candidate gene-based genotyping information of 4957 SNPs in a structured population of 60 sequenced desi and kabuli accessions (with 350–400 kb LD decay), detected 11 significant genomic loci (genes) associated (41% combined PVE) with branch number in chickpea. Of these, seven branch number-associated genes were further validated successfully in two inter (ICC 4958 x ICC 17160)- and intra (ICC 12299 x ICC 8261)-specific mapping populations. The axillary meristem and shoot apical meristem-specific expression, including differential up- and down-regulation (4–5 folds) of the validated seven branch number-associated genes especially in high branch number was apparent as compared to the low branch number-containing parental accessions and homozygous individuals of two aforesaid mapping populations. Collectively, this combinatorial genomic approach delineated diverse naturally occurring novel functional SNP allelic variants in seven potential known/candidate genes [PIN1 (PIN-FORMED protein 1), TB1 (teosinte branched 1), BA1/LAX1 (BARREN STALK1/LIKE AUXIN1), GRAS8 (gibberellic acid insensitive/GAI, Repressor of ga13/RGA and Scarecrow8/SCR8), ERF (ethylene-responsive element-binding factor), MAX2 (more axillary growth 2) and lipase] governing chickpea branch number. The useful information generated from this study have potential to expedite marker-assisted genetic enhancement by developing high-yielding cultivars with more number of productive (pods and seeds) branches in chickpea. Abstract: This paper examines farmers’ perceptions and understanding of climatic variability, coping strategies adopted and factors that influence the choice of a particular adaptation. The study uses cross section data collected from 510 farmers in three mountain gradients sites, namely; Mount Kilimanjaro of Tanzania, Taita and Machakos Hills of Kenya. Farmers’ perceptions were compared to actual trend in meteorological records over the last thirty years (1981-2010). The result revealed that farmers in East Africa were partly aware of climate variability, mainly in temperature and rainfall patterns. Many respondents reported that conditions are drier and rainfall timing is becoming less predictable. The perception of farmers on temperature and rainfall were in line with recorded meteorological data, but contrary with that of recorded rainfall in Machakos which was perceived to be decreasing by the farmers. Farmers perceived changes in rainfall and temperature to have negative effects on the production and management of crops. The common adaptation strategies used by farmers include water harvesting, soil conservation techniques and shifting of planting periods. The most important variables affecting farmers choices in regards to adaptation option were, lack of access to credit, farming experience and household size. As a conclusion, there is a need for these factors to be taken into account in the development and implementation of smallholder farmers’ adaptation strategies to climate variability in East Africa. Additionally, dedicated capacity building and extensive outreach initiatives on adaptation through governments, researchers, policy-makers and the farmers groups themselves are needed to achieve large scale success. Abstract: The Assessment and comparison of yield gap of the demonstrations over farmers practice under IPPPT component. 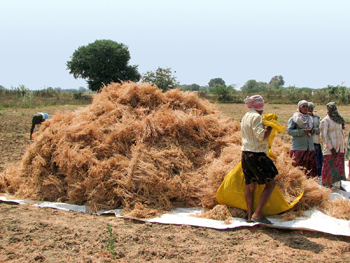 The demonstration was conducted in several village of Jabalpur during year 2008-2011. The average chickpea yield was obtained 16.16 q/ha, which was higher than the farmers practices (11.58 q/ha) and the data observed that max yield potential of chickpea 20.3 q/ha through Improved Pulse Production Protection Technology (IPPPT). The IPPPT programme was effective in changing attitude, skill and knowledge of recent technology for high yielding varieties, balanced dose of the fertilizer and biological disease management of chick pea including their adoption. Abstract: Pigeonpea is the only food legume where cytoplasmic-genic male sterility is being exploited for commercial use of hybrids. The discovery of stable CMS system and breeding of commercial hybrids in pigeonpea has become a landmark in increasing the productivity of this crop. Keeping in view the combining ability estimates were worked out through Line x Tester analysis of 10 hybrids developed by crossing 2 lines (Males) with five cytoplasmic male sterile (CMS) lines (Females) to know the genetic architecture of yield attributes. Analysis of variance revealed significant differences among genotypes, crosses, lines, testers and Line x tester interactions for most of the traits. Preponderance of non-additive gene action was realized by higher values of specific combining ability compared to general combining ability. The average degree of dominance were more than unity (>1) and predictability ratio was less than unity (<1) for all the traits, signifying non-additive gene action resulted from dominance, over dominance, epistasis and various other interactions. Hence, heterosis breeding is effective for increasing yield potential of hybrids in pigeonpea. The proportional contribution of testers was observed to be lower than that of line x tester interactions, thus highest estimates of SCA variances. The estimates of GCA effects indicated male parent ICPL 87119 was good general combiner for days to maturity and pollen fertility and among the female parent ICP 2043 was good general combiner. Cross combinations ICP 2043 x ICP 87119, ICP 2048 x ICP 20108, ICP 2078 x ICP 87119 and ICP 2092 x ICP 20108 were found to be good specific combinations for seed yield plant1 and other desirable traits.